In 2014, examination for CE, CS, EC, EE and ME papers is being held in multi-sessions. Hence, for these papers, a suitable normalization is applied to take into account any variation in the difficulty levels of the question papers across different sessions. The normalization is done based on the fundamental assumption that “in all multi-session GATE papers , the distribution of abilities of candidates is the same across all the sessions”. 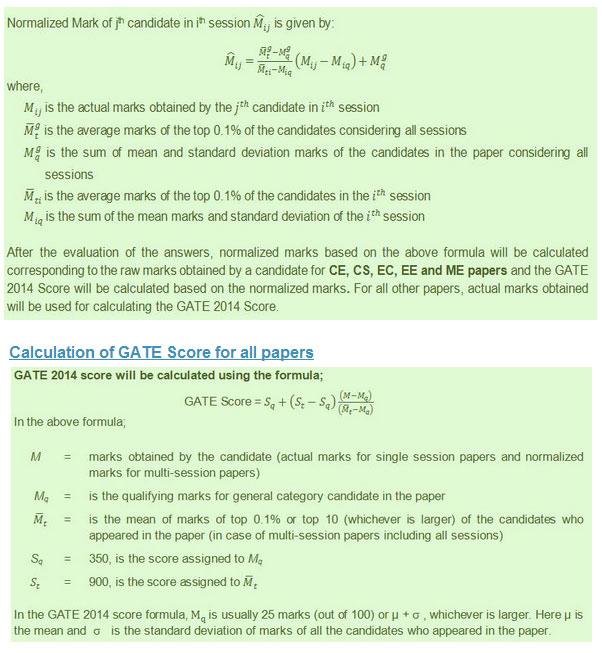 This assumption is justified since the number of candidates appearing in multi-session papers in GATE 2014 is large and the procedure of allocation of session to candidates is random. Further it is also ensured that for the same multi-session paper, the number of candidates allotted in each session is of the same order of magnitude.